any kind of experience to do this, the answer is...no! It was our goal to transform my client's classic style pedestal table from Ethan Allen. 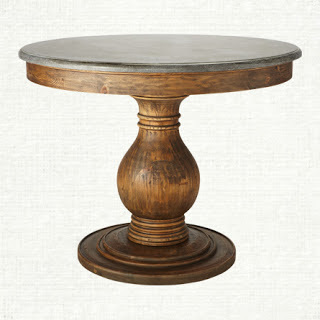 set out to re-create the weathered look of our inspiration, Arhaus Luca Dining table. came up with something similar to the stain on the Luca dining table. nooks and crannies. She used a scraper to remove the stain strips/goop. stain off, the difference is it will come off in dry strips vs goop. 3) Sand well, time consuming but worth the trouble. She did an awesome job! 4) At your own risk! She hosed it all off and let it dry in the sun. paint brushes, yes one has a screw sticking out of it, and a sheet for applying the stain! Briwax - Natural Wax after the stain dries. exactly how this particular wood would take the stain without a lot of trial and error. We love the weathered look, and think we were blessed with some beginner's luck! A lot of hard work, but the beautiful end result was well worth it. congrats for tackling this project! Looks INCREDIBLE. LOVE it. All your work paid-off Pam! I didn't know the stripper came in a spray. I just used the gel on my table. This looks great, and it is a whole lot of work. This is gorgeous. Doesn't look like it's the same table anymore. So high end. That is so beautiful - I love the weathered look! Sometimes it is just worth the time and effort of stripping off the original finish and working with the bare wood! Beautiful! So much better now. It's just beautiful! Good job! What a pretty kitchen. Stunning table! A lot of work, but well worth it! Gorgeous! I love the finish. It's so fresh looking and a little beachy too! Lovely! I love my warm, rustic table. Pam, once again you saved me big $ with your vision and help. I thought I needed to buy a new table when all I needed were good brushes and a rag! (Even after scraping, the Citrus residue was preventing the gel from applying correctly, so I thought a once in a lifetime shower for my table wouldn't hurt the wood.) Everyone thinks I bought a new table! Oh my goodness, I just LOVE how this finish came out. I don't think it was beginner's luck, I think you're very good at what you do and have a great sense for these kind of projects!!! I wish this table was mine!! Hope your client is enjoying her beautifully refreshed space! Fantastic results! Refinishing my pedestal kitchen table has been on my to-do list for ages. It's got a super dark, shiny finish and shows every scratch and smudge. This is exactly the new look I want! Love the spray Citristrip tip - will definitely give it a try! Stunning!!! I'm so impressed. It looks amazing. You did a fantastic job. Gorgeous Pam .. love the chair fabric! it came out great!!! 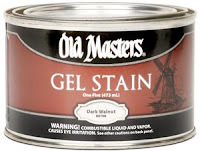 That gel stain is good stuff!!! Looks great! Your common sense in using the expertise at the paint store and taking the leaf in was so smart. Great instructions as usual. I have used Briwax for years on our antiques and used over Annie Sloan Chalk Paint too. You guys are a couple of smarties! Way to go saving a million trips to the paint store. So pretty! Now that's an improvement! I love the layered look you created! Wow, that turned out beautiful! Great job! WOW! What a change that made! It looks great and I love the chairs, fabrics, etc....awesome job! It looks AMAZING! The hard work definitely paid off. Love it! I love that color, it is perfect and feels so "now", beautiful job. Honestly, I think your table turned out better looking than the Arhaus version!!!!! Excellent job as always Pam! This is such a beautiful table Pam. I know it was a lot of work sanding and and scraping to get that old finish off, but wow, so worth it! My niece just bought a table similar to this to refinish, I think this will give her inspiration to tackle the job! Kudos to your client!--love that she has DIY bragging rights, not just what a designer put in place. The table turned out so beautiful Pam. As usual, so many great tips! Gorgeous job....looks fantastic..I so love Arhaus! Looks great. I just did a round dining table myself but I chose to use wipe-on poly for the top because I was afraid that wax would leave marks when anything hot, cold or wet touched it. We had a waxed vintage table just a few months ago and it was horrible about watermarking. A real pain to say the least so I got rid of it! holy charmbuckets. that is a fabulous transformation. this is my favorite blog party to visit.bravo to you! Pam, that is one happy transformation! Love how it turned out! Gorgeous! I really love the color! What an exceptional re-do. I have an heirloom Ethan Allen table w/ six chairs.... I dare not take on such a big challenge, but one day, when it's passed down to my daughter.....maybe she can update it like this. Fascinating and gorgeous. Just followed you from Pinterest. The trick is to leave it on overnight, or just go to work. I take plastic bags and press them into the Citristrip to hold the stuff against the wood. A 2nd coat does remove the stain. In big, squooshed off glops of BBQ-like goo. It's amazing. I also neutralize with water (like the furniture bath above) because mineral spirits will reliquify the stain back into the wood. I love this stuff so much, I do kitchen cabinets in front of the TV, in my pajamas. One cabinet a day. The very hardest part is not to fuss with the Citristrip., or even to peek! Anyway, your color combinations on this table worked beautifully. I'm sure your friend is thrilled every single day! I'm going to try this - I have a long rectangular table the exact same golden color - yuck! and love this look! Someone commented about using wipe on poly? not sure what that is instead of wax to avoid watermarks and heat...any update on how this table has held up with the wax? Any other tips or info to note since the original post? Hi Unknown! Thanks so much, good luck with your table! I haven't ever used wipe on poly, but I'm guessing it might be a little shiny. It's the table they use every day and is still perfect, she hasn't done anything to it since my original post. Love how this table turned out. Did you use clear or light brown Briwax? Is there common reapplication of the Briwax? I hate the shiny polyurethane look! Hi Jenn! Thanks so much! :) We used Original Briwax, I showed a photo of the exact can above, it didn't specify any color. We applied with a clean white t-shirt and used long strokes working it into the grain. Good luck with your project! Can you use polyacrylic over the wax? My table is a kitchen/dining table - and I fear wax would not withstand the water marks. I was wondering if you know what type of wood the table was made from? I'm very sorry about the mix up with your name. I'm trying to duplicate the color of that table, it's gorgeous, but I'm working with a red oak table. I was curious if you knew what type of wood the table you refinished was made from? Hi there! I know it was oak - not red oak. Good luck! Thank you so very much for getting back to me! !